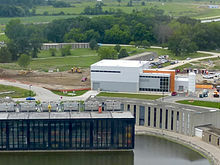 Fermilab as of 2016[update] stands to become the world leader in Neutrino physics through the Deep Underground Neutrino Experiment at the Long Baseline Neutrino Facility. Other leaders are CERN, which leads in Accelerator physics with the Large Hadron Collider (LHC), and Japan, which has been approved to build and lead the International Linear Collider (ILC). 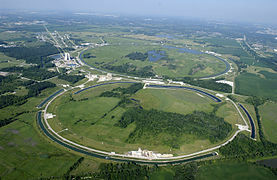 Fermilab will be the site of LBNF's future beamline, and the Sanford Underground Research Facility (SURF), in Lead, SD, is the site selected to house the massive far detector. 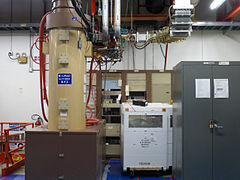 The term "baseline" refers to the distance between the neutrino source and the detector. The far detector current design is for four modules of instrumented liquid argon with a fiducial volume of 10 kilotons each. The first two modules are expected to be complete in 2024, with the beam operational in 2026. The final module is planned to be operational in 2027. LBNF/DUNE program in neutrino physics plans to measure fundamental physical parameters with high precision and to explore physics beyond the Standard Model. The measurements DUNE will make is expected to greatly increase the physics community's understanding of neutrinos and their role in the universe, thereby better elucidating the nature of matter and anti-matter. 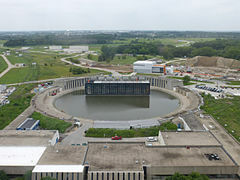 It will send the world's highest-intensity neutrino beam to a near detector on the Fermilab site and the far detector 800 miles (1300 km) away at SURF.